Discovering your purpose: Find your extraordinary in your ordinary. FIND YOUR EXTRAORDINARY IN YOUR ORDINARY What do you consider “ordinary” in what you do? What do you do or think that you take for granted and feel “oh, everyone can do that”? Most of the times we are not aware of the unique attributes or WHAT we are doing, saying, contributing. There is a huge message in what we all consider our “ordinary”. Our true extraordinary is found in our ordinary. As example, I am a quick sketch artist who has the uncanny ability to find the essence or heart of communications, people, nature…I find the heart of things…I find “purpose” or the WHAT and WHY of things and bring this to focus for folks. For myself, I truly feel everyone is an artist, all can doodle and tell picture story…what is so special about that? THAT is my unique purpose, my unique WHAT and it comes so naturally I assume that this is not that extraordinary. Take a bigger look to actually see the unique details of you. Take a look at what you are in flow with from a distance…a larger view. Imagine you are in an airplane looking down at YOU from 30,000 ft up. Take some time from that perspective and watch what you do for at least a week. Journal your “doings” during the day. Jot down what you feel comfortable doing and what is challenging. Could be as simple as how you are thinking and how you respond to needs and solutions. Do you have a repeated way of “doing” or “being” that you just do automatically? It’s like the ketchup in the refrigerator door…it is there right in front of you…you just do not see it! Your ordinary is really not ordinary at all it is your map to your WHAT! Your purpose is what you do over and over again and again. It is your department of redundancy department. To actually write down or illustrate your extraordinary is very important. Get a piece of paper, draw a bullseye with your named extraordinary in the center…then put all the benefits of your unique talent in the rings around the bullseye. Post this where you see it everyday. Give yourself “credit” in this physical world, name it, share it, be it…stand in it. It is so important to tell yourself and others what you naturally excel at and find value. We hide by telling ourselves “that is just my ordinary”…nope, we are camouflaging our extraordinary by not claiming it and finding value in it. Understanding the unique value of what is inside our ordinary easily communicates our extraordinary. Find focus, build confidence, attract your audience, spark your heart purpose and pass that spark to others by claiming and knowing the value of your WHAT, your extraordinary. Show your extraordinary with pictures. You can create pictures, quick sketch doodles or hire a person (that’s where my unique extraordinary quick sketch talents come in!) to help you draw up and discover your WHAT, your value. Quick sketch doodles are fast ways to show folks your talent and ideas in a non-intimidating manner. From power point slides, meeting summaries, mapping out future scenarios, even for requests for event sponsors, all can be communicated clearly in a quick focused manner with quick-sketched visuals. It’s all about “show and tell”. Look into your ordinary to get to the heart of your extraordinary, then and show it to yourself and others…it’s there, draw it out, show up and show it! 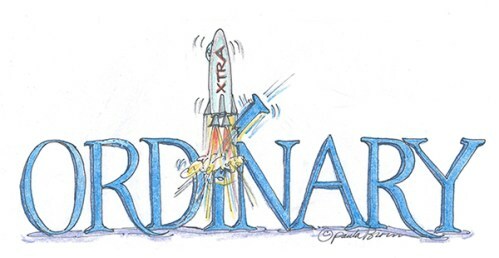 This entry was posted in Archives and tagged Discovering your purpose: Find your extraordinary in your ordinary. by Paula Brown. Bookmark the permalink.